CancelCable.com | How to watch streaming internet videos on any TV using just your computer. How to watch streaming internet videos on any TV using just your computer. There are a lot of great set top boxes out there that let you watch streaming TV and movies via the Internet, but maybe you’re not interested in spending the money or you’re just looking for a very simple way to hook your computer up to your TV and watch videos from popular websites like Hulu or different web sites. Here are five different ways you can connect your computer to your TV and watch streaming internet video…. The first thing you need to check is if you have a newer TV and computer which will let you use an HDMI cable to connect the two (don’t worry, there are still ways to do it if you don’t). 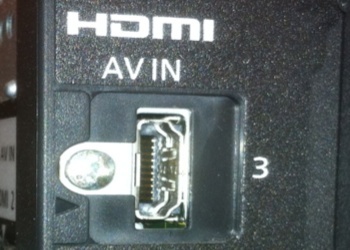 Most newer laptops have HDMI outputs or in the case of Apple products like the Macbook, have adapters you can use to connect an HDMI cable to. Here are 2 examples. The first one is a picture of a standard HDMI output on a PC notebook, the second one is the MiniDisplayPort output on a MacBook which can be hooked up to an adapter to connect to a HDMI cable. Once you get a HDMI cable, just connect your computer to your TV, use your remote to select ‘HDMI’ input and with any luck you should see a mirror image of your computer screen on your HD TV. Now you have a very simple inexpensive way of watching Internet content on your TV. But what if you have an older TV or an older computer that doesn’t support HDMI? If you have a standard definition TV, you won’t be able to use HDMI, but if your TV and computer have S video jacks and you have S video cable, you can follow the above steps to hook everything up. But what if you have a real old TV or real old computer that doesn’t have any fancy inputs or outputs? Just about all TVs made in the last 30 years have RCA inputs. These are the red, white and yellow jacks that you see on the back of your TV which were commonly used to hook up VCRs, DVD players and video games. And just about all laptop computers ever made have what’s called an external VGA port that can be used to connect the laptop to a monitor. Luckily, there are number of PC to TV converters which plug into the VGA port on your laptop and the RCA inputs on older TVs. But what if you have a really, really, old TV? And on the chance that you have an even older TV, maybe one made in the 50′s or sixties, you can use a RF modulator in conjunction with a converter and still watch streaming Internet television on your TV using the coaxial antenna connection. 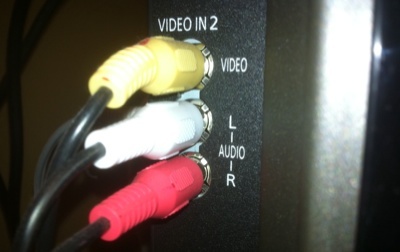 All of the above options help you connect the video output to your TV. This means you’ll either need to listen to the audio on your computer speakers or plug your computer into your stereo or entertainment system, or a simple set of amplified speakers. Also since you’re using your computer and not a specialized set top box, it’s possible that the video quality might not be as good or might not completely fill your TV screen, but this really depends largely on how fast your computer and graphic card is and the web site you are visiting. Tip: when you’re watching Internet videos, be sure to look for the ‘full-screen’ icon on the video player which maximizes video to the largest possible size.